Two major focuses for making the automotive dials are accuracy and clarity. The markings need to be designed and imprinted with utmost care. The high quality material and advanced manufacturing process ensures the visibility of marks with minimal light input from backside of the dials. Our organization is a pioneer in manufacturing world class Cluster Dials. Under the able guidance of our trained professionals, we offer Dial Type Instruments at a reasonable price. 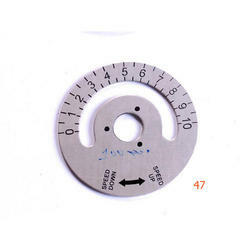 Dial Type Instruments is commonly used in industrial and mechanical processes. It is available in the market at an affordable price. We manufacture Dials Plates on Aluminium, Brass and S.Steel through Anodized Offset Printing, Photographic Chmical Etching process. Plate Size could be up to 4x4 feet in single piece through etching process. Upto 18x18 inches through offset printing process. 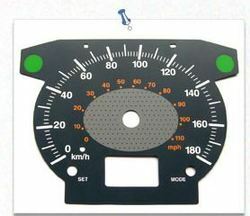 - We are among the largest suppliers of printed dials in India. We offer Automotive Dials, which are fabricated using quality raw material. Our range is available in innovative design, sizes, shapes and colors to suit the requirements of clients. The important markings in automotive dial are carefully imprinted by skilled designers to maintain accuracy. CSPL has extended its decals expertise in Automotive Dials in the year 2010 & since then leading supplier in India as well as global. CSPL has grown with 50% CAGR in last 3 years with major supply to Automotive, appliance, electronic & other industries.